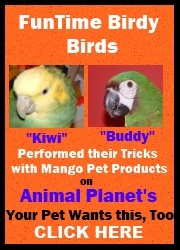 Welcome to FunTime Birdy's Parrot Playgym and Bird Stand Selection Page. All FunTime Birdy playgyms are unique in the fact that all the bird toys are at eye level for a maximum playing experience for your feathered friend. Also, all bird toys on our FunTime Birdy Playgyms are included in the price of each playgym. Most importantly all our playgyms are bird tested and bird approved. Please click on the picture below that best fits the size of your feathered friend to see our full selection of parrot playgyms.